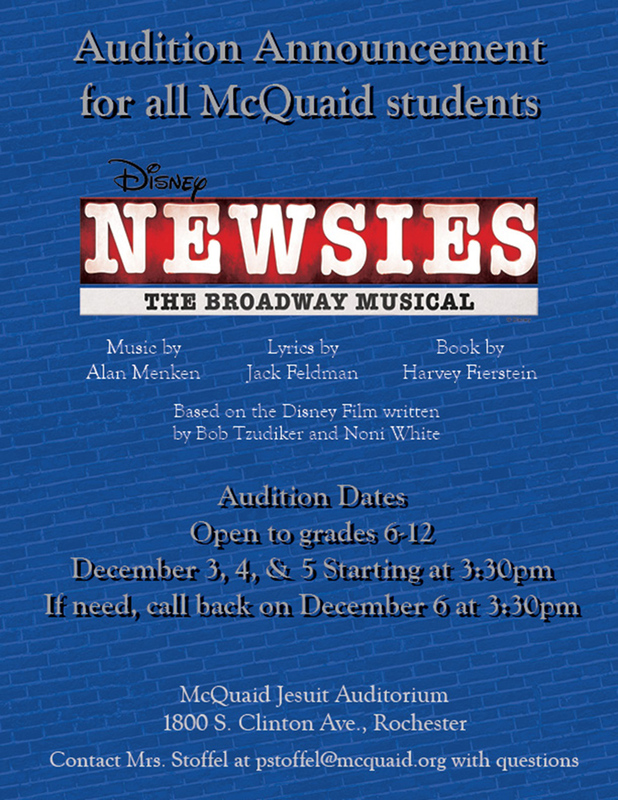 McQuaid Jesuit is pleased to announce auditions for the exciting Tony Award winning musical Newsies. Within one minute after MTI released the show for amateur performances, we were the first in Rochester to secure the rights to produce this fabulous show. Based on the real-life newsboy strike of 1899, the show is set in turn-of-the-century New York City and chronicles the story of Jack Kelly who dreams of becoming an artist and escaping his life as a newsboy. When publisher Joseph Pulitzer raises newspaper prices at the expense of Jack and his fellow “newsies”, the boys are forced to take action at the risk of losing their jobs altogether. The music is exciting, moving and a perfect backdrop for some spectacular dance numbers. Auditions for Newsies will be held in the McQuaid auditorium Monday through Wednesday, December 3rd through the 5th from 3:30 to 5:30/6:00 p.m. If needed, call-backs will be held same time, same place on Thursday December 6th. You only need attend one of the audition days and you need not prepare anything in advance as we will teach you some of the music and a dance routine that you will use for your audition. Go to YouTube to view material from the show if you are not familiar with the plot or characters. While a heavy male show, making this is a great opportunity for all McQuaid students. If you have questions please contact me at pstoffel@mcquaid.org.